This hard Swiss beauty is great for grating, and it's one of your best companions on a cheese board. It is a cheese of many shapes—on a platter you find it as little cubes called Möckli, or thin rolls. Both the cubes and rolls come in snack packs at the supermarket or kiosk and are perfect to take with you on the train (especially if you've left your Swiss army knife at home). And if you only serve one cheese at an Apèro, make sure it's those salty little Sbrinz cubes. The cheese itself is centuries old and, according to the Kulinarisches Erbe, there is already mention of Brienzer Käse in 1530. The name may come from an Italian dialect word for hard cheese, sbrinzo, but the better origin story links it to the town of Brienz, where exported cheeses were brought before their journey over the Alps in the 16th and 17th centuries. There is even a Sbrinz Route that you can hike through the Alps as they did (while carrying great wheels of cheese) many years ago. (Here's the hiking guide in English). Sbrinz has been an AOP protected product since 2002. For a fully mature and super flavourful Sbrinz it can take up to two years of ripening. The Swiss often use Sbrinz as a replacement for Parmesan in recipes. It differs slightly from its Italian cousin because it contains more fat and is therefore not quite as brittle. And that's exactly what I have done here in this Sbrinz variation of Eggplant Parmesan that's baked rather than fried. I checked out many Eggplant Parmesan recipes when coming up with the one below—Jamie Oliver, The Silver Spoon, Marianne Kaltenbach's Aus Italiens Küchen, and even Martha Stewart, who also had a baked version. In a shallow dish lightly beat the two eggs. Add the breadcrumbs to a second shallow bowl. Season with salt, pepper, and herbs to your liking. Add the flour to a third bowl. 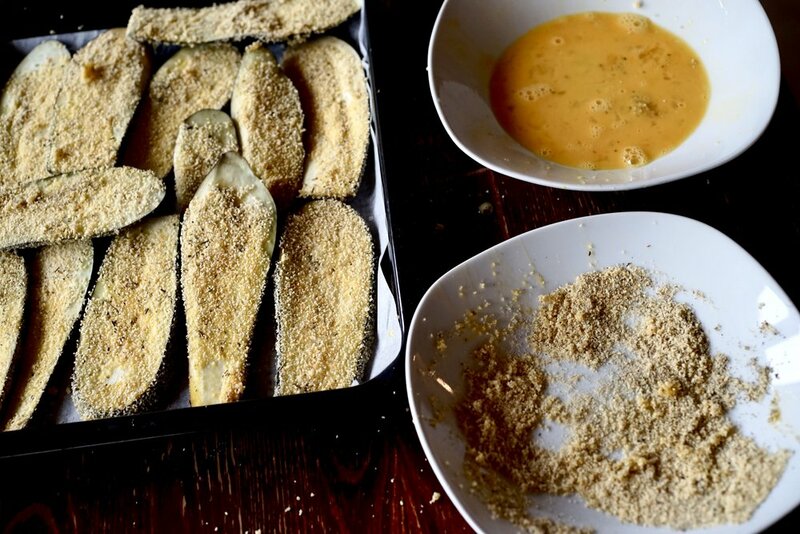 Piece by piece, dip the eggplant slices in flour, then egg, and then breadcrumbs. Place in a single layer on a parchment lined baking sheet. Bake for about 20 minutes, flip, then bake for about 20 minutes more. In the meantime, make your tomato sauce. In a large pot, heat the olive oil the fry the onions until translucent. Add the garlic and cook for a few minutes. Add the tomatoes, then season to your liking and let cook over medium heat. 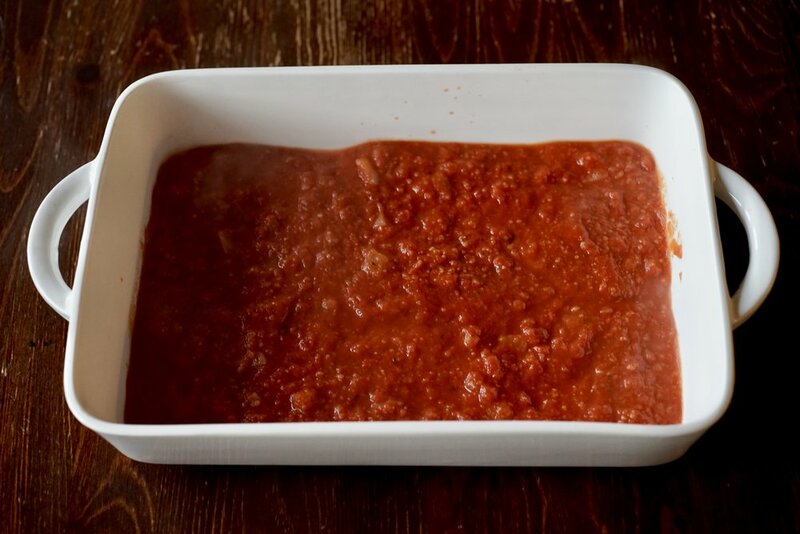 In a large casserole dish, spread a thick layer of tomato sauce. Add a layer of baked eggplant, then sprinkle with Sbrinz. Keep layering until you run out of ingredients. Once you get to the top, sprinkle over the mozzarella. Bake for about 30 minutes, or until the sauce is bubbling and the cheese is browned. If you don't have Sbrinz, you can use another hard cheese like Parmesan or Gran Padano. You can also use any tomato sauce that you have readily available—you'll need about 1.25 litres (5 cups). You can replace the cans of tomatoes with passata. 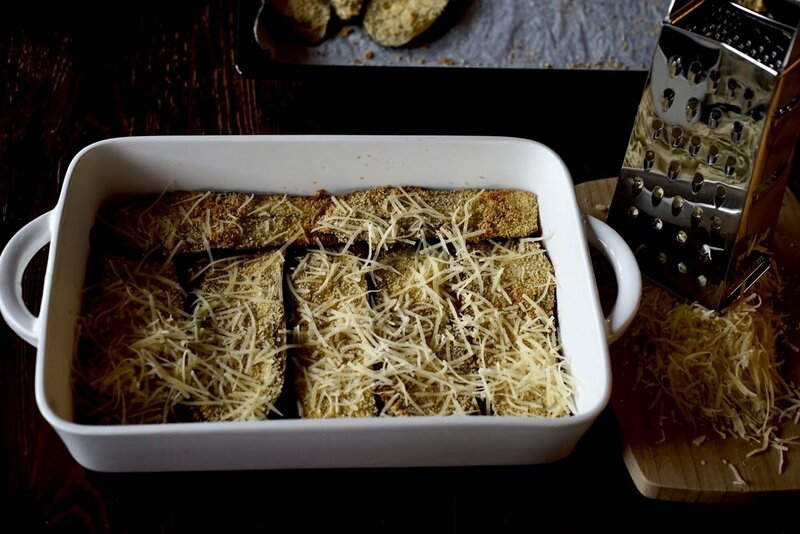 Authentic Eggplant Parmesan would have you fry or even deep fry the slices of eggplant before they go in the casserole instead of baking them in the oven. I like to double this recipe and make a second casserole that I freeze after baking. Reheat directly from frozen.